Last Wednesday I was delighted to help host a dinner with Barbara Santilli who works with Andrea Franchetti on both of his estates – Tenuta di Trinoro in the south of Tuscany (Val d’Orcia) & Tenuta di Passopisciaro (Mount Etna, Sicily). The dinner was at 1 Lombard Street which I recommend, it is an old banking hall right in the middle of the City by Bank. The evening was created to showcase the two estates. 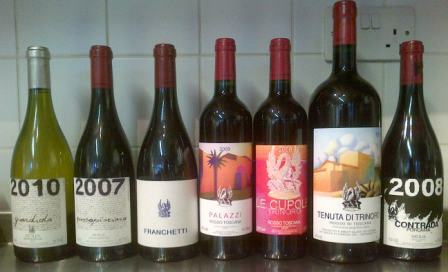 It is a great pleasure to be able to show 7 different wines and 5 different vintages across the two estates. Those numbers correctly suggest that Andrea is not into simplicity in fact I would say that the term “maverick” is accurate here. I always feel a touch uncomfortable using a phrase like that has it is banded around willy-nilly these days but I hope some of the observations below show you why I feel it applies here. Guardiola 2010, Tenuta di Passopisciaro, this is totally un-oaked and vibrant as a result, elements of stone fruit and grapefruit show through, the balance is excellent and whilst lovely now (as they would drink it in Sicily) it is even better in 9-18months. A wine of texture rather than wild flavours. Passopisciaro 2007, Tenuta di Passopisciaro, I have loved this wine from the off and recommend it to people who love something different but classically proportioned, it is not a dark rich coloured wine (but then neither is Grenache, Nebbiolo or Pinot Noir) the fruit in the 2007 is very much red, it is a pretty but in no way superficial wine. Serve it cool is my top “tip”. Both these wines were accompanied by a very good Smoked Haddock Risotto with soft Quail eggs and Mustard sauce. Palazzi 2009, Tenuta di Trinoro, is a wine Andrea has only made in 1997, 1999 & 2009, he deemed it too easy to make and stopped for the 9 vintages in between (maverick you see?). It is from 100% Merlot in 2009, it is decadent expression of this variety with a high toned richness, whilst it will, and should ideally be, aged, it is in such balance that it is easily appreciated now. Only 200 cases were made. Interestingly the label features the front of Andrea’s house, the back of the house is on the first wine – Tenuta di Trinoro. Franchetti 2009, Tenuta di Passopisciaro by contrast is 80% Cesanese d’Affile & 20% Petit Verdot (other vintages have been the other way around) is it a denser wine with more power and more rich fruit but the fruit itself is more violets and black creamy fruit than the hedonistic Palazzi. I was intrigued by how different these were (they should be) so asked the assembled to vote which they would own if they could own just one bottle of either. Franchetti edged it 22/18!! Le Cupole 2008, Tenuta di Trinoro, Cupole which means dome is the second selection of the estate. The 2008 is very balanced with a more savoury edge than I remember the extrovert 2007 having, best from now on it will age well but no real need in my opinion. Tenuta di Trinoro 1998 magnum, Tenuta di Trinoro, the guest next to me rather wonderfully wrote “religious experience” on his notes. This was mighty fine, a wonderful balance again but in a developed way, this will age gracefully but for me is wonderfully now, amazing given how it was only the second wine from the estate. There is a decadence about Andrea’s wines that show how he loves to pick late – typically October in Tuscany and November in Sicily. This wine bodes so well for all he has done since because it was just lovely. Interestingly Barbara noted that Andrea feels 2001 and 2009 are the very finest vintages he has made since he started in 1997. And that was that, a cracking evening with insightful comments from Barbara and a lovely atmosphere.